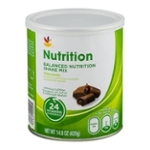 Sugar, Milk Protein Concentrate, Maltodextrin, Soy Oil, Cocoa Powder (dutch Process), Natural And Artificial Flavors, Short Chain Fructooligosaccharides, Canola Oil, Calcium Silicate, Carrageenan, Magnesium Chloride, Sodium Citrate, Soy Lecithin, Corn Oil, Soy Protein Concentrate, Magnesium Phosphate, Potassium Citrate, Choline Chloride, Vitamin-mineral Blend (ascorbic Acid, Vitamin E Acetate, Niacinamide, Ferrous Sulfate, Zinc Sulfate, D-calcium Pantothenate, Manganese Sulfate, Copper Sulfate, Pyridoxine Hydrochloride, Vitamin A Palmitate, Riboflavin, Thiamin Hydrochloride, Folic Acid, Biotin, Potassium Iodide, Sodium Molybdate, Chromium Chloride, Phytonadione, Sodium Selenate, Cholecalciferol, Cyanocobalamin), Dicalcium Phosphate, Salt, Potassium Chloride. Contains: Milk, Soy Made In A Plant That Also Processes Eggs, Peanuts, And Wheat. Notice: Not Intended For Use As A Complete Diet. You Must Eat One Balanced Meal A Day. This Product Is Not Formulated For Children.